​i. There shall be reasonable grounds for believing that the subjects are regarded as eminent by a majority of members of their own profession or calling. ii. They shall be instantly recognisable to the well-informed passer-by, or they deserve national recognition. iii. They will be individuals, or groups, who should have achieved national or international prominence in a significant field (e.g. academia, the arts, education, industry, the law, medicine, music, religion, science etc.) or they have made an important contribution to the development of the town or well-being of its citizens. iv. Without exception, proposals for the commemoration of famous people shall not be considered until they have been dead for five years or the centenary of their birth, whichever is the earlier. v. Proposals will not be considered for commemoration of individuals still living. vi. A person's association with Stamford should have been the place of their birth or education, or their residence should have been a significant period, in time or in importance, within their life and work. vii. The design of the plaque will be approved by the Stamford Civic Society Committee and shall be erected in accordance with all local planning and regulatory requirements. viii. A building marked with a plaque must be clearly visible from the public highway without the need to enter private property. ix. A plaque shall generally take the form of a circular ceramic plaque of high fired stoneware ceramic, 450 mm (18") diameter, approximately 20 mm thick at the edge, slightly domed. Frost proof and fade proof. 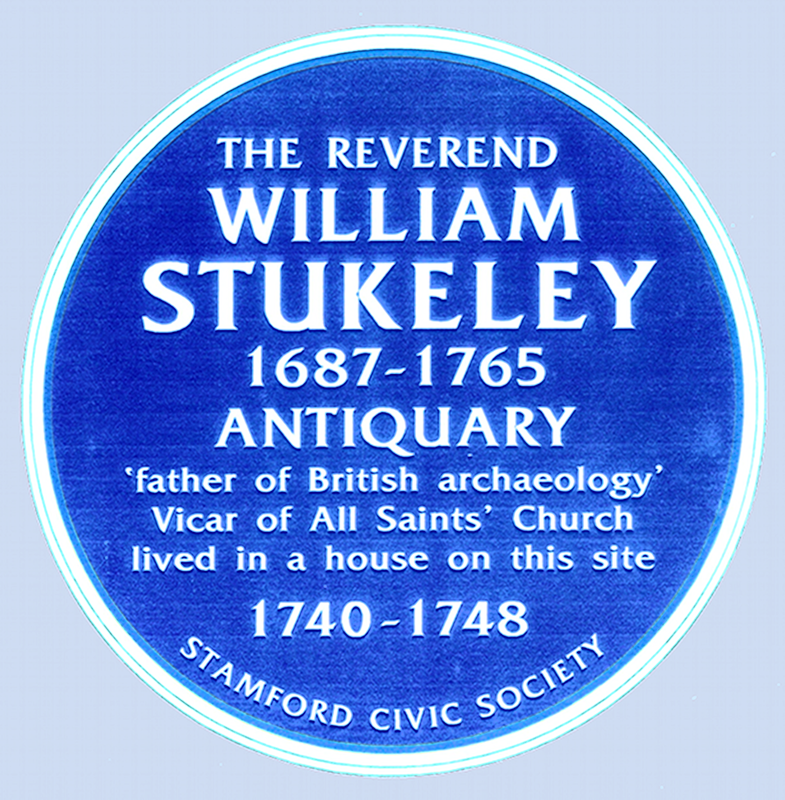 As per the Society's first plaque for William Stukeley located in Barn Hill (2010). Plaques will be surface mounted with mortar lines used for fixing (2 concealed stainless steel screws fixed with lime mortar) and placed at an adequate height above ground level so as to avoid risk of malicious damage. x. Unless a case is deemed exceptional, plaques shall not be erected on educational or ecclesiastical buildings. xi. A building, or person, shall not be commemorated solely because they figure in a work of fiction. xii. Consent must be obtained from the owner(s) of the building. xiii. Overseas visitors: They should be of international reputation or of significant standing in their own countries.